Katie Brown gives student Fily Galicia-Chavez an eye exam on Martin Luther King Jr. Day. The 2nd Annual Martin Luther King Jr. Pediatric Vision Outreach at UAMS was a day providing vision care to commemorate a visionary. Fily was one of nearly 70 students seen by a handful of volunteer doctors and assistants during the event. Nine organizations, four UAMS departments, and two local schools united to provide the opportunity for free eye exams and glasses to students in Little Rock and the surrounding areas. 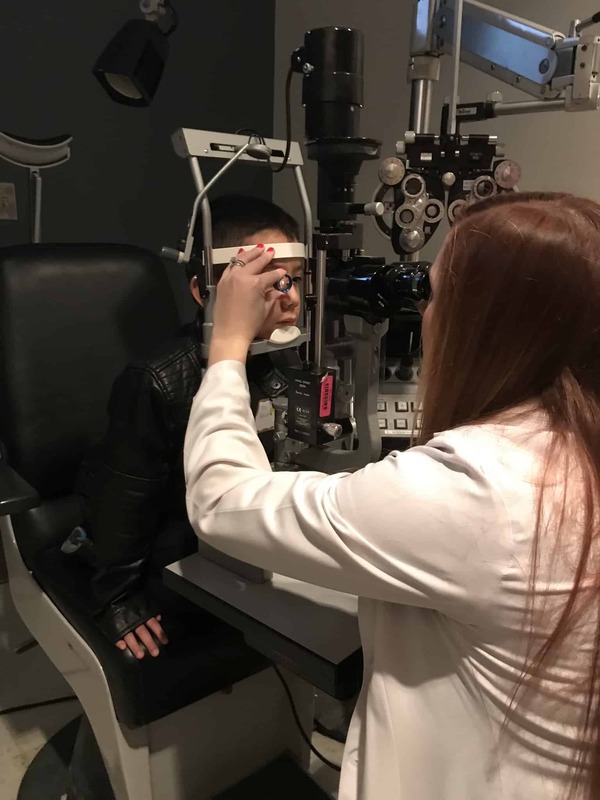 “The goal is to reach the two out of three Arkansan children who fail their school vision screenings without receiving follow-up eye care,” said second-year medical student John Musser, founder of a nonprofit called Rural Ophthalmology Optometry Treatment & Screening (ROOTS). 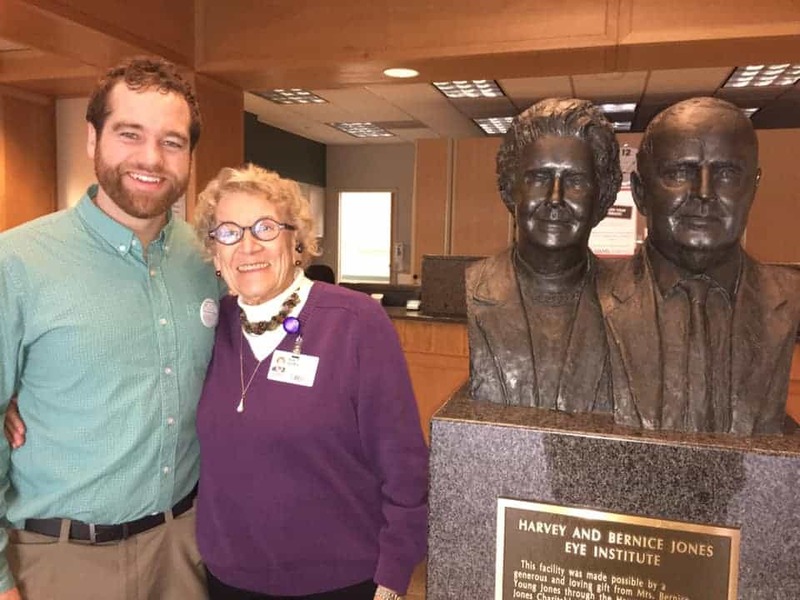 At the UAMS Harvey & Bernice Jones Eye Institute, 66 students were given a free comprehensive eye exam by a volunteer eye doctor and then were provided prescription eyeglasses. Frames for the glasses were donated by Sue Griffin, Ph.D., vice chair of Basic Research in the UAMS Donald W. Reynolds Department of Geriatrics. Tim Norton, O.D., from Contact Lenses X-Press provided the eyeglass lenses for the second consecutive year at no cost. At last year’s event at the Shepherd’s Hope Neighborhood Health Center, a dozen area students were seen by Katie Brown, O.D., Sami Uwaydat, M.D., and a team of medical students and ophthalmic technicians, in the inaugural event for ROOTS. Brown and Musser coordinated more than 50 volunteers with the goal of improving the vision health of local children. Brown said she and Musser reached out through the Arkansas Department of Education State Nursing Consultant Cheria Lindsey and the Little Rock School District Coordinator of Health Services Margo Bushmiaer to reach all school nurses within 50 miles of Little Rock to share this opportunity with the students who had failed their vision screenings. 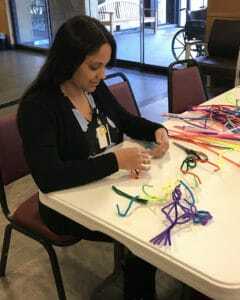 Melissa Stueben, with the UAMS College of Health Professions, volunteers at a craft station set up for kids as they await eye exams. To make the eye exams more accessible, they worked with Billy Thomas, M.D., M.P.H., and the UAMS Center for Diversity Affairs to arrange shuttles so parents could drop their children off at one of two Little Rock schools. Volunteers at Stephens Elementary School and Chicot Elementary School provided a safe presence at the community shuttle sites. The shuttles transported the kids to the UAMS campus for their eye exams and returned them afterward. “Transportation is sometimes one of the biggest barriers to getting kids the follow-up they need, so we wanted to take care of that for them,” said Brown. Pastor Mike Blanchard and Brenda Covington, M.D., of Shepherd’s Hope Neighborhood Health Center managed the outreach’s documentation and compliance coordinated by Angela Johnson with the Jones Eye Institute. Portable photo-based autorefractor devices, which are ideal for pediatric use, were provided by the Arkansas Children’s Hospital Circle of Friends, the Episcopal Collegiate School, and the Lion’s Club of North Little Rock. 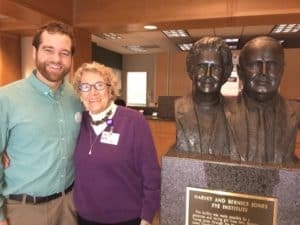 The UAMS Office of Interprofessional Education approved the free clinic as a “service learning event,” empowering UAMS students to get involved in their local community. More than nine doctors from UAMS, Arkansas Children’s, and the surrounding community participated, including three from the Arkansas Optometric Association’s charitable foundation, Vision Arkansas. “It was a team effort, absolutely,” said Musser. Brown, too, said she was pleased with the group effort. Co-organizer John Musser with Sue Griffin, who donated all the frames for made-to-order prescription glasses. “It was amazing the response we had from UAMS and our community of volunteers. We couldn’t have done it without every single group that participated. It shows that we are not only committed to improving awareness of the importance of vision and its strong connection to learning, but we are willing to do whatever it takes to get the children of Arkansas quality eye care,” said Brown.